Sustainable Cities: Could renewable energy and demand reduction lead to the collapse of the energy market ? The aim of this post is to understand the impact of renewable energy (RE) and demand reduction (DR) on the business model of the Australia electricity industry. At a macro level the level of impact of RE and demand reduction DR on the electricity market will depend on how quickly RE and DR emerge, the degree of correlation of these elements with market changes, the resilience of the market, and the flexibility of the market to change. There are four markets in operation in Australia – the NEM, WAEM, NT, and Horizon Power. Any policy measures must be conscious that currently each of these operates under different regulatory regimes (although the NEM is by far the most significant market). existing infrastructure is “locked in” given it is built. fair regulated return on assets that does not create split incentives with RE and DR. The impact of the RE on the “merit order” has been documented to negatively impact generators (Ketterer, 2012) (Sensfuß, 2007), by reducing the value and increasing volatility of the wholesale market (Ketterer, 2012) (Green, 2010). uncertainty of prices may jeopardise future investment and risk supply. Network operators are somewhat protected from significant changes to the market. For example in the NEM their revenue and capital expenditure are based on 5 year rolling plans submitted to the Australian Energy Regulator (AER) (Davison, 2010). Once approved income is based on this allowable revenue against the approved costs (which include a return on capital). 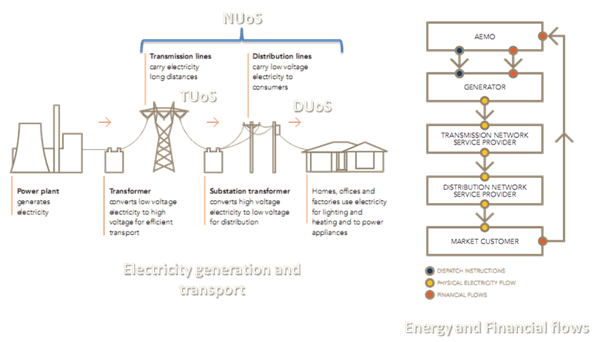 The impact of RE and DR is the networks ability to adapt to more distributed generation (AEMC, 2009) and to some of the technical challenges presented by new intermittent power. These challenges are broadly categorised as (AEMC, 2009) maintenance of system voltages (given wind and solar bring little reactive power), management of power system inertia and maintenance of power system frequency. Retailers are passed cost changes from generators and network providers and pass these costs to consumers. Modelling for the RET scheme indicated that the cost to consumers would be $4.6 (B) in wholesale electricity prices however this can be mitigated by DR as 25% of retail electricity costs can be attributed to peak load requirements (DRET, 2012) Clearly there will be significant increases in network charges depending on the geographic expansion to the network (Skelton, 2012) . Few believe that RE and DR will lead to collapse of the energy market and that in general “…the current market is framework is capable of absorbing change” (AEMC, 2009). Having said that the participants in the market have complex financial arrangements and are very interdependent (AEMC, 2012). AEMC explores scenarios which could lead to distress in market and outlines that prolonged period of high spot prices could impact on hedge contracts, credit exposures, and debt covenants. intermittent generation leads to peaking plants having “tight capacity margins” (AEMC, 2009). In reality many of these risks are mitigated by existing laws and regulation – both specific to the electricity market and general Australian corporate governance (such as Australian Financial Services Licence requirements). Market participants are also protected contractually (with Force Majeure clauses and insurances). Retailer risk is managed through a process called Retailer of Last Resort (ROLR) (AEMC, 2012) however this is not full-proof if it leaves retailers over-exposed. There are also physical protections in the system with dispatch being managed every five minutes for both network capacity and maintaining frequency. Some argue that in the mid-term these variations should not be a problem if a market for carbon inclusive hedging develops and depending on the distribution of wind assets and range of time weighted prices (Green, 2010) (which in the UK was only 4%) . Careful management of regulatory change as participants are increasingly privatised. In a period of significant complexity and change there are many factors that are weighing on the future of the Australian energy sector. The policy measures above address this uncertainty and provide solutions that, along with existing market frameworks, ensure a seamless transition to a more sustainable future. Abhyankar N, A. N. (2011). Impact of large-scale energy efficiency programs on utility finance sand consumer tariffs in India. Stanford: Energy Policy. AEMC. (2012). NEM financial market resilience, Issues Paper. Sydney: Australian energy market commission. AEMC. (2009). Review of Energy Market Frameworks in light of Climate Change Policies. Sydney: AEMC. Alvarez, a. R. (2010). Impact of Energy Efficiency Incentives on Electricity Distribution Companies. IEEE TRANSACTIONS ON POWER SYSTEMS , 1865-1872. Climate Change Authority. (2012). Final RET Review Overview Document. Davison, M. (2010). 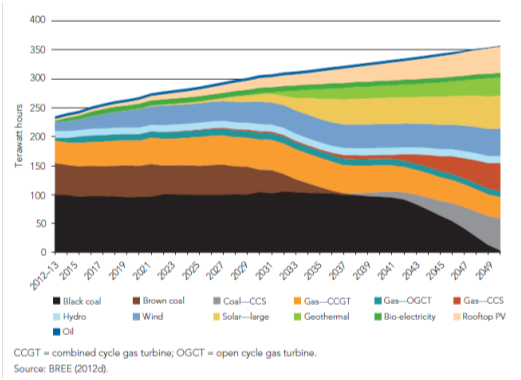 Austrlalian energy market overview. Adelaide: Wesex consulting. Department of resources, e. a. (2012). Energy white paper 2012. Green, R. V. (2010). Market behaviour with large amounts of intermittent generation. Energy Policy , 3211-3220. Ketterer, J. C. (2012). The Impact of Wind Power Generation on the Electricity Price in Germany. Leibniz Institute for Economic Research at the University of Munich. Leveque, F. (2006). Introduction. In F. Leveque, Competitive electricity markets and sustainability (pp. 1-21). Cheltenham: Edward Elgar Publishing. Sensfuß, F. (2007). Assessment of the impact of renewable electricity generation on the German electricity sector An agent-based simulation approach v. DISSERTATION . Karlsruhe. Skelton, R. (2012). Renewable Energy Target Review - Discussion Paper Response from Macquarie Generation.